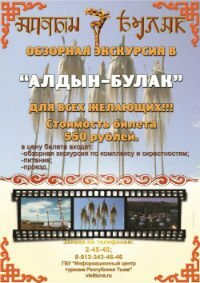 Charity Foundation 'Dersu Uzala' named after legendary Tuvan actor Maxim Munzuk, set up a year ago by Galina and Svetlana Munzuk and other Tuvan actors, is planning to hold this year its first large-scale activity – ecological Film Festival “Following Dersu Uzala's Live Path'. Parliamentary Commission from Tuva is expected these days in Kiakhta (Butyatia), where in the end of January two Tuvan soldiers, who left their military unit without permission, were killed. Tuvan shaman Nikolai Oorzhak is going to hold a 2-days seminar in Moscow in the end of March. The program of the seminar includes khoomei workshops and teaching the technique of opening up chakras for 9 types of sounds to channel the energy out into the Universe. A concert dedicated to the memory of Gennady Chash, one of the best Tuvan sygyt performers, born 45 years ago, takes place today in Shagonar, Ulug-Khem district centre. Chash was one of the first propagators of Tuvan khoomei abroad. 'Ustuu-Khuree' Festival Organizing Committee has determined the new dates for the festival. It will be held for the 8th time in Chadan in July, 5-9. Famous Tuvan musicologist Valentina Suzukei is now finishing her scientific work 'Musical Culture of Tuva in the 20th century'. The main idea of this research states the originality of Tuvan music which cannot be structured in accordance with the common European standards. Tuva-Online Information Agency is turning today 3 – not a jubileum date in Europe but quite an event in Tuva to hold a Doy ceremony! It is a ritual taking place on child's third birthday when he has his hair for the first time cut (that is why before this age boys are very often taken for girls in Tuva) and is presented with numerous gifts. The child acquires his own property made up of sheep, horses, camels etc. Protest actions against the recent substitution of social benefits by cash payments have taken place in Kyzyl. The rally initiated by communists gathered on the main square of the capital 300 people who came there despite the severe frost which Tuva is overcoming this winter. Tuvan Naadym won't any more be celebrated on August, 15 as it used to be before together with the Day of the Republic. Tuvan Government considers it an extra luxury for the republic whose budget is 90 per cents donated from Moscow. Shagaa will remain the only national holiday accompanied by an official day-off. The date for it every year will be fixed by a special resolution of the Legislative Chamber of the Great Tuvan Khural (Parliament) as it was this year - on February, 9.